Save time with Widgit Online's ready made symbol resource packs available in the Extras section of Widgit Online. These packs are developed to suit a range of activities and needs and are available to purchase and add to your account at any time. Some account types come with additional symbol resources already included. Note: Resource packs available are dependent on your accounts language / location. Group Accounts: Purchased resource packs are available to the whole group. Only Admins and Managers can purchase and install symbol resource. The Extras page lists all of the resources available to purchase. Note: If there are no resources available in your country, the Extras option will be removed. Group Accounts: Only Admins and Managers can access the Extras page. You can purchase additional symbol resources online via PayPal, or by contacting Widgit (or your local reseller), to pay by invoice. To purchase online, select your billing country at the top of the extras page. This will set the correct VAT/ Tax for your location. Click the Add to basket button by each pack you would like to purchase. At the bottom of the page you will see the total and a link to check out with PayPal. Complete the PayPal check out process to complete the transaction. Once a symbol resource has been purchased it is available to install from the Extras page. 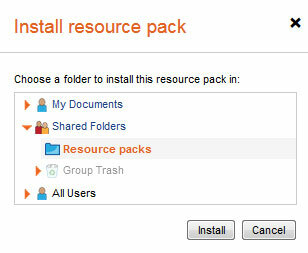 Click on the Install resource pack button. Then you will be prompted to navigate to where you would like to install the pack. Click Install. NOTE: The installation process can take a few minutes. 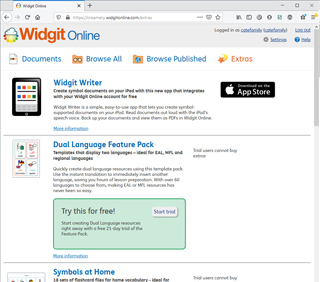 While it is installing you can continue to use Widgit Online. You will see the 'Upload in progress' message. on the Documents page. When your upload has finished, refresh the documents page in your browser to see your new files. You can also find a list of your Recent uploads next to the Upload button. You can install the symbol resources as many times as you like. The files can be edited, viewed and printed, the same as any other grid or document. If you edit resources you can always install another copy to go back to the original version.